You can display a test pattern to aid in adjusting the projection status without connecting video equipment. Press the Pattern button on the remote control. 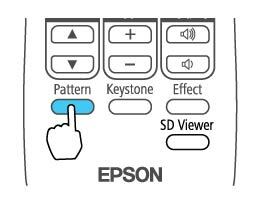 Press the left and right arrow buttons on the remote control to select a pattern from the displayed list.